A couple nights ago, I made the Tempeh Helper from Appetite for Reduction. It was the first time I’d had *anything* Helper. When I was a kid, my parents (by which I really mean my mom) refused to keep junk food in the house. While my classmates had Gushers and Capri Suns and those adorably small bags of Doritos overflowing from their Power Rangers lunch boxes, I had baby carrots and leaky thermoses of juice and homemade peanut butter and cracker sandwiches waiting for me. While my friends gleefully gorged on Captain Crunch for breakfast, I mournfully munched on cornflakes. While my peers sucked down Coke, I sipped on water. Soda and artificial colors and chips were just not welcome in my house, thank you very much. I always looked forward to road trips with my dad, because I knew he was more tolerant of junk food and would stock up on Pringles and Arizona iced tea. Score! So, perhaps needless to say, we didn’t really keep any sort of Helper around the house, hamburger or otherwise. Therefore, my experience with Isa’s Tempeh Helper was my virgin foray into being Helped. Rawr! I totally ignored Isa’s pasta recommendation for this dish and made it with my new favorite pasta shape, cavatappi. I can’t get enough of those big ol’ spirals! And I think it worked; they paired nicely with my “rustic” chunks of tempeh. So, what did I think about this Helper experience? Well, it was tasty, but not mindblowingly amazing. I love me a nutritional yeast-based sauce, but I honestly felt that the Easy Breezy Cheezy sauce was a teensy bit bland. The sauce calls for two tablespoons of broth powder, and Isa recommends Frontier’s “chicken” broth powder. I was quite excited to discover that my co-op carries many a Frontier powder (thanks for the co-op membership, mum! ), so I happily purchased a small bag of said powder. However, the Tempeh Helper recipe also calls for two tablespoons of the same broth powder, and I felt that the entire recipe (Helper + sauce) was sort of a one note deal – the “chicken” broth flavor overpowered everything else! 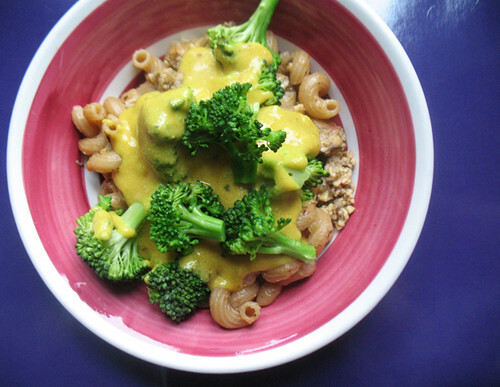 Now, maybe that’s the allure of the Helper franchise, and perhaps anyone who grew up on Hamburger Helper would take one bit of the Tempeh Helper and be walloped with a massive smack of nostalgia. But my Helper-less childhood rendered me immune to those sort of attacks. That said, it was still a totally satisfying meal, and I’d probably consider making it again… but I’d mix up the spices for sure. Were you a junk-food-deprived kid like me, or were your parents less strict? Have you tried Isa’s Tempeh Helper? What did you think? ← Vegan Bake Sale for Japan! My house was a pop-free, no sugar cereal zone. I lamented it at the time but I’m really appreciative now. But…we did get gingerale when we were sick. I know now that sugar isn’t good for a healing immune system but I still crave it given that ritual from my past. I’ve never tried a helper. But now that I get to make the house rules maybe I should. I feel the same way – I thought my parents were sooooo unfair, but now I completely respect their decision to limit our junk food intake! And I hear you re: ginger ale – I know that it’s just HFCS and questionable ginger flavor, but we were also allowed to drink it when we were sick, and I can’t help but want to drink it when I’m feeling less than great! Well, this momma thinks you had a very good momma that “deprived” you of crap food! Unfortunately, I grew up on junk. Lots of it. When I wasn’t inhaling the non-stop smoke from the multiple chain-smoking adults in the house, I was “enjoying” Lucky Charms and Fruit Loops for breakfast, bologna and Velveeta for lunch and various types of pre-packed kinds of dinners (I still shudder at the thought of Helper and those god-awful condensed cream soups – believe me, I feel NO nostalgia whatsoever!). I didn’t eat a banana until I was 12 and I didn’t know that vegetables came in anything but cans, either. The first time I tried fresh baby spinach (in my early teens), I thought I had died and gone to heaven! Is it any wonder that I am an organic vegan as an adult?! Oh man! That’s quite the diet. I can’t even imagine how wonderfully fresh and delicious fruits and veggies would taste in comparison to packaged junk! I used to love going to a friend’s house where her mom would make pork chops smothered in cream of mushroom soup and creamed corn from a can. Now I look back and think YUCK!! Their Friday nights consisted of Hamburger Helper where mine was bbq meat and veggies. There was nothing better than the canned ham sandwiches my best friends mom would make on store bought white bread. Today I look back and think…GROSS!! I was a junk food deprived child. I remember being so mad that my mom made homemade whole wheat or grain bread and all the other kids got to have sandwiches on white Wonder Bread!! I was also upset that my mom always made homemade oatmeal chocolate chip cookies while everyone else had Oreos. Oh how awful it was! Today, I am VERY thankful for the food choices of my parents. It has definately made me more aware and made the transition to a gluten free vegan just that much easier. I am definately going to try your helper! Thanks for the idea! Ha! Yeah, I also remember that white bread seemed so exotic and enticing. My brother had a friend whose mom made “the bessssstttt” grilled cheeses ever, and she made them on white bread. So whenever my mom made us grilled cheese, my brother would complain that it wasn’t good because it was made with whole wheat bread. Hmm, good to hear! I’ll definitely make it again and serve it on plain ol’ pasta and broccoli, because I think it’d really work there. I’m a huge fan of Happy Herbivore’s cheezy sauce, which includes miso, so I think I missed that in the Easy Breezy Sauce.